GROWTH IN SAUDI HAY DEMAND LIKELY TO HAVE WORLD-WIDE IMPACTS - and illustrates the global nature of water limitations. As if one more example of our interconnected world was needed - the depletion of an aquifer 8,000 miles away is likely to impact on alfalfa growers in Seeley, CA or Pasco, Washington. Seeley and Pasco (the Imperial Valley of California and the Columbia River Basin of Washington, respectively) are major producers of hay for export. Exports are a key aspect of hay markets in the entire western US, and have buoyed hay prices in the past two years, as domestic dairies have been in an economic slump. Exports have grown considerably the past 10 years (see export blog reports), but still consist of less than 4% of US alfalfa hay production. Changes in Saudi Policy. The Kingdom of Saudi Arabia brings up visions of oil wells and sheiks – but the kingdom is regionally important in dairy production and exports milk products to other parts of the Middle East. Saudi dairies are modern and sophisticated, and milk production per animal is the highest in the world at over 10,000 liters/year (world average is 2,200 l/year). (Note: Saudi average production per cow is about the same as California, about 23,000 lbs/year). The Saudi Almarai Dairy is one of the largest in the world, and owns forage production operations in Saudi Arabia, the US, Argentina and other nations. Costs per liter in Saudi Arabian dairies are above those in major exporters such as the United States, New Zealand or Ireland. That means Saudi dairies rely on import barriers on dry milk power and related products to maintain some of their market. However, beginning in 2016, the Saudi government embarked upon a 3-year program to conserve water resources by greatly reducing its domestic production of alfalfa, wheat, corn and several other commodities important for dairy and livestock production. The productivity of Almarai and other Saudi dairies relies, in part, on key dairy feeds that include high quality alfalfa hay, corn silage, and miscellaneous forages (such as sudangrass and Rhodesgrass). However, the continual depletion of aquifers in the Arabian Peninsula has created a tremendous challenge as the domestic production of alfalfa there is constrained due to water limitations. Foreign Ag. Service Report. A recent report (February, 2017) by the USDA Foreign Agricultural Service (FAS) illustrates the dynamics of this water restriction mandate and the Saudis' emerging market for imported hay products. The FAS estimates that 2016 hay imports into Saudi Arabia totaled about 380,000 metric tons (MT). Total forage production in the country was estimated to be about 4 million MT per year. It is unknown how much hay will be eventually imported into the kingdom, but FAS estimates project imports to reach 1.2 million MT of high-quality alfalfa hay once the transition is complete in 2018. Other industry sources have put this number higher. The import subsidy for alfalfa hay is currently $59/MT, and subsidies are also available for corn, soybean meal, distillers dried grain and other feedstuffs. Saudi Arabia dairies, similar to Almarai, have developed their own production areas in the United States, and other regions to cope with uncertainty in forage supplies. Where will this imported hay originate? Currently a majority high of the high quality alfalfa comes from the US, mostly from the Western US, where hay for export is now a common feature of the agricultural landscape (see recent UC blog on export). 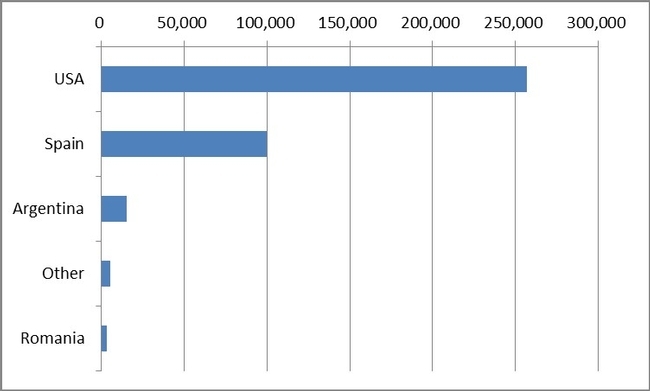 According to the FAS, the US is the main supplier of alfalfa hay to the kingdom, with Spain being second (Figure 2). Figure 2. Imports of alfalfa hay into Saudi Arabia, 2016 (USDA-FAS, 2017). Many countries will likely try to compete with the US for this market, including nearby production regions in North Africa, Middle East, Southern Europe and Eastern Europe. These nearby regions have advantages in terms of distance but other factors are important as well. South America (Argentina primarily), Canada, South Africa and Australia are also likely to participate. There have been recent efforts to develop new alfalfa production in Sudan and Ethiopia, Morocco, Pakistan and Egypt, but limitations of management, infrastructure, and transportation have proved to be important. These regions face problems of political instability which makes investment risky. Weather patterns which limit the production of high-quality hay products (such as summer monsoon rains) may also play a factor. Dehydration infrastructure in Southern Europe may provide an advantage for curing, but it is uncertain whether dairy producers and their nutritionists prefer sun-dried vs. dehydrated hay. The United States has disadvantages in supplying alfalfa hay for the Saudi market due to the distances from the West Coast ports (or even the South and Eastern ports), but has major production advantages; high-quality hay can be produced under dry conditions, and advanced infrastructure and transportation systems. The Saudi market must also compete for West Coast hay with closer Asian export markets as well. For example, China is a major and growing destination for West Coast hay, due to our ability to produce high quality products and shipping advantages to Asia (Figure 2). Figure 2. Growth markets for US exported alfalfa hay. (Volume of Monthly Hay Exports to China, Saudi Arabia and United Arab Emirates, Jan 2007-Dec 2016- Source: U.S. Department of Commerce). Note: hay destined for China may be greater than reported above for 2016 here due to mislabeling of alfalfa as grass hay in the datasets (total was likely 1.4 million MT in 2016). 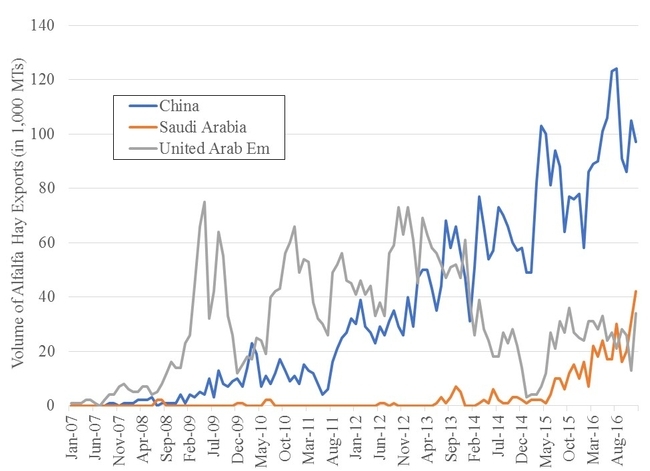 The United States has seen a rise in exports to Saudi Arabia starting in 2013-2014 and expanding rapidly over the 18-month period starting spring, 2015. This increase mirrors the rise in exports to UAE 9 years ago, and to China 8 years ago (Figure 2). The UAE demand has stabilized considerably from its rapid expansion in 2009-2013 (Figure 2). The Water Link. Much of Saudi agricultural production was developed utilizing center-pivot irrigation, based upon ‘fossil' aquifers that have been continually depleted over the past decades, and will not be likely be replenished in human history. These are the water resources which the Saudi government now wishes to conserve. This will mean that the kingdom will require perhaps millions of Metric tons of alfalfa hay to support domestic animal production, mostly dairy. This illustrates the global nature of food demand in balance (or imbalance) with water and land resources. Some have decried the ‘export' of virtual water in the form of alfalfa hay from the United States (see articles by LA Times , CNBC, NPR and earlier in the Wall Street Journal. Of course, many agricultural exports are produced using irrigation water, including wheat, wine, fruit, almonds, walnuts, corn, soybean and rice, most of which are exported in larger percentages than alfalfa hay. The key point is that farming uses many inputs and hay can be economically produced in and exported from the arid West because of many advantages that offset scarce water. Water scarcity and uncertainty are important in many areas of the world, which will challenge food production, and water resources wherever agriculture is practiced. A key consideration is whether water resources are managed sustainably, whether grown in the Arabian peninsula or in the Pacific Northwest or in the Colorado River basin. Saudi Arabia is increasingly recognizing that growing alfalfa for livestock feed may not be a sustainable use of their limited and expensive groundwater. The emerging Saudi market for hay is still in its infancy, but has been increasing rapidly and is likely to have an important impact on alfalfa production in many parts of the world, including the Western United States. hay production. Please don't work against us. Not at all. Imperial is an amazing place for hay production. My main point is the opening of a new markets for farmers and the fact that it's linked to world limitations in water. The water issue isn't just local - something we should pay attention to. The questions of exports is much more complicated, of course. I think I heard recently that well over 40% of CA ag. production is dependent upon exports. Dairy is the #2 export product in CA (alfalfa in another form). Alfalfa is somewhat of a minor crop for exports compared with many others (almonds, wine, rice, citrus, wheat, etc.). You raise a good point about importing goods from China and Asia (as well as oil from Saudi Arabia), which is part of the point about world trade. A careful 'balance sheet' for the water balance of trade, would show we're probably importing more than we're exporting ('virtual water').